I am from Medford. Born and raised. I live in the house I grew up in. My parents bought the house when I was in the womb. I kicked my parents out, they are now living in a trailer somewhere warm... OK,not really. They retired to Florida (and live in a house). 2) when did you join BTT? and how long doing tris? I joined BTT in 2007. I was introduced to BTT by Janice Beiderman, whom I worked with at the time. She had been pointed out to me as "the other pharmacist who rides her bike to work". Janice and I hit it off, eventually bike talk turned to triathlon talk. I had always been interested in triathlons, but didn't know much about them. Through Janet's suggestion, I got onto BTT Public and then went to the Sister-Sister SGR at Regina's. At that SGR, I specifically remember Laurie D and Derek Keller being so warm and welcoming, starting off the run with Regina and hitting my LT within 10 minutes, and meeting Mary Beth, who was also a "BTT Public" person and at her first SGR as well. 3) what attracted you to triathlon? I am a goal-oriented person and like to try things are slightly outside my comfort zone. I had run a couple of marathons (1998 and 2000) and I wanted a new challenge. Triathlons seems like the next logical goal. My first race was Mooseman International 2007. There were a number of notable experiences there... (1) I freaked out on the swim. I started hyperventilating and couldn't keep my face in the water. I couldn't hold my breath long enough to get the breast stroke going. After consulting with the kayaker, the side stroke was determined to my most efficient stroke. So I finally settled in and side-stroked it the whole way. (2) At T1 I remember changing into my bike shoes and realized that I peeing. I was a little embarrassed, I hadn't planned it... it just sort of happened. (3) Getting going on the bike was a challenge. My cleats were full of mud and I could clip in. I stopped a few times. This was the first time using the Speed Play system (mistake #1), so I didn't know about the mud thing and how to trouble shoot. I got off the bike 4 times to try to get the mud out. I finally got help at the 2-mile runners aid station. The volunteer gave my cleats an enema and flushed all the goop away.... I was off and riding. The final blunder was (4) a case of indecent exposure. It was such a humid that day, so unzipped my bike shirt a bit to get a little air. I didn't realize that I had unzipped it so much that I was essentially running in must my sports bra. I sort of cringed when I saw the finisher picture. My second race was sort of notable as well, as I had a DFL finish (Dead - F - Last). Kennebunk Maine International. It was a cold ocean swim. I was last out of the water by 10 minutes. The bike was completely alone. I had the support vehicle on my tail the whole way. I actually stopped to tell him to back off a bit. I approached dismount and was told I missed the cut-off by 3 minutes or 30 seconds... I forget. OMG. My jaw dropped and I pleaded with the guy to let me go. I said the run is my strongest sport. When he asked my pace, I started saying "9 minute pace", but decided to say "8, 8:45".... He let me go on. I didn't get 8:45 pace, but was under 9. It is always a fear to be last, and I never thought I would ever be last. Turned out not to be so bad. I did get a great finisher photo with the "last runner" motorcycle behind me. 5) did you swim/bike/run or play any other sports in high school? In high school I play soccer for 1 year and was a cheerleader for 1 year. The JR High gym teacher told me to join the track team once I got to High School, but I got a paper route instead. I do regret never following up on the track team suggestion. the most frustrating or challenging part? I love the people and fun times. For me it's mostly social but it's also a good way to challenge myself. It always feels good when you know you put out your best effort. The most frustrating part is the swim. The best comment about my swimming was "you seem to be working hard, but you're just not going anywhere". 7) do you have any role models or someone that inspires you? why? 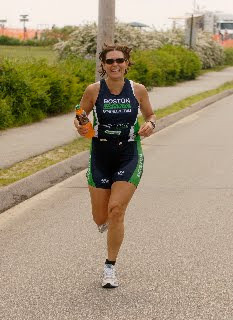 I don't have any specific role models, but I am inspired by the "can do" attitude that many people in triathlon have. At this stage of our lives, most of us have realized certain limitations, have demanding lives, or have had unexpected sets backs (personal, physical, mental). It doesn't matter your situation, everyone has stuff that they are dealing with. I am inspired by the people who find a way to overcome and push through. Rather than giving up and using excuses, they find a way to make it work and show up with a positive attitude and a smile on their face. 8) besides swimming, biking and running, what do you do for fun? any hobbies or interests outside of triathlon we should know about? I like starting home improvement projects. I think I'm pretty handy and I have a decent lineup of power tools. I also love going on bike tours. I'm heading out to Wisconsin this summer. It's like a party on wheels for 7 days. 9) Any funny/embarrassing/awesome race moments you have to share?